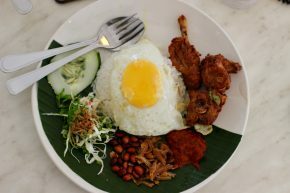 While there is undoubtedly a confluence of cultures in Sandakan, classic Malaysian cuisine seems a little hard to find, especially when you can only eat so much street food. San Da Gen Kopitiam offers just that. The look and feel is clean and resembles a coffee shop much more than a restaurant. Yet, on a blackboard there is a menu filled with all kinds of foods to order.